Do you live in Leesburg? Leesburg is a city in Lake County, Florida, United States. The population was 15,956 at the 2000 census. As of 2005, the population recorded by the U.S. Census Bureau is 19,086. 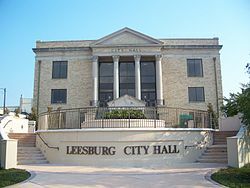 Leesburg is located in central Florida, between Lake Harris and Lake Griffin, at the head of theOklawaha River system. It is part of the Orlando–Kissimmee–Sanford Metropolitan Statistical Area. Leesburg is the home of Lake-Sumter State College (LSSC) with campuses also in Clermont, Florida and Sumterville, Florida. It is also the home of Beacon College. Leesburg was first settled in 1857 by Evander McIver Lee. Several of Evander Lee's brothers followed him to the area. One of these brothers, Calvin Lee, was credited with giving the town its name. In the early 20th century, Leesburg was an important center forwatermelon production. In 1930, Leesburg held its first Watermelon Festival, an annual tradition that would last until watermelon production in the area dwindled to the point that watermelons for the last festival in 1957 had to be brought in from outside the area. Lake Square Mall, the city's major shopping mall, opened in 1980. On March 19, 1982, Ozzy Osbourne's guitarist Randy Rhoads, as well as the band's cook and bus driver, were killed in a plane crash at Flying Baron Estates. The citrus industry was the principal business in Leesburg for many years, until devastating freezes in December 1983 and February 1985 persuaded growers to move their groves further down the Florida peninsula. In 1997, Leesburg Bikefest started. It has since become an annual spring tradition, with upwards of 250,000 people visiting the motorcycle festival. Today, most of Leesburg's growth and economic development is the result of the increasing popularity of the area as a retirement destination and the rapid growth of nearby Orlando. The last scene in the 2009 film "Away We Go" was filmed here. In 2011, the Leesburg High School boys basketball team won the 4A state championship. According to the United States Census Bureau, the city has a total area of 24.4 square miles (63 km2). 18.7 square miles (48 km2) of it is land and 5.8 square miles (15 km2) of it (23.65%) is water. Several major highways pass through Leesburg, including U.S. Highway 27, U.S. Highway 441 and S.R. 44. Florida's Turnpike passes just to the south and west of Leesburg. Leesburg was on the Western leg of the historic Dixie Highway.